빌뉴스, 리투아니아의 리얼 하우스 B&B | 호스텔월드에서 예약하세요. Bed breakfast tries to provide excellent service, which can be found in hotels. Real House B&B is located in the heart of Vilnius Old Town and offer elegant accommodation with free Wi-Fi and LCD TVs. The historic Town Hall is only 350 meters away. All apartments at have been recently renovated and equipped with modern bathrooms. The living rooms done in white and beige, feature striped armchairs and patterned, tiled floors. The apartments located on the ground floor have Venetian blinds for the guests’ security. 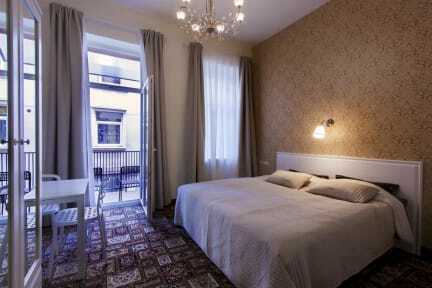 Rooms are comfortable and recently redecorated. It includes wi-fi, microwave, mini-kitchen, dishes, teapot, refrigerator, hairdryer, coffee, tea, sugar, television, and if requested also ironing-board and iron.The apartments have working reception from 08:00-22:00. Kind receptionists bring the breakfast straight-up to your room and the desired time (no continental breakfast). For additional price airport shuttle service is provided (20 eur). Payment upon arrival by cash, credit cards, debit cards. The reservation must be confirmed with credit card details. The hotel has a right to pre-authorise credit card.